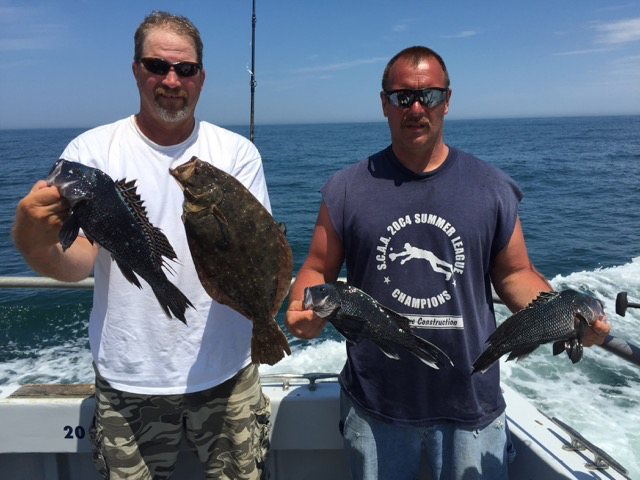 Opening Reservations For August on Monday, July 3rd, 8 AM -- These are "We'll Fish For What's Biting Trips" .. Might be flounder, might be sea bass, might be a mix. If you absolutely have to have one and not the other, don't reserve! Sailing Daily For Sea Bass - Weather Permitting - (Nicking a few flounder some days too!) Saturday's 6:30 to 3:30 - $125.00 – Otherwise 7 to 3 at $110.00..
Summer fishing.. Some days sea bassing is very good indeed. Other days I'm thankful clients can even stink a pan. Catch a nice fish fry - life is good. 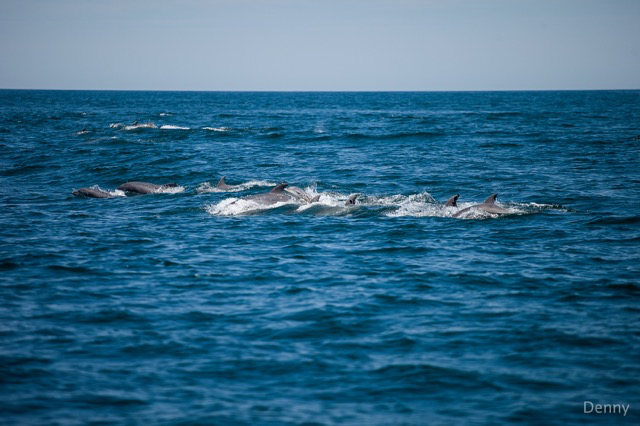 Saw what was easily in my top 5 gatherings of bottlenose dolphin. Had to have been over 400 of them. Nick Denny captured quite a few in a frame here. Will attempt to post video on FaceBook ocfishing Not the guy for posting something everyday. I am a guy who has labored for decades trying to improve fishing through habitat & reasonable regulation. Great Scott! Why in Billy Blue Blazes has the Navy got to do whatever it is they're doing on our Queen Reef? Just when I thought I thought their survey noise impacts were done -- LOUDER! What in the world are they doing? The Sheila Bordelon was back again on June 29th. It happened that Capt. Kane (Fish Bound) & I were of a similar mind; wanting to start at the Queen Reef Site. On approach I could see this +-250 foot ship was on station again over the wreck of the African Queen -- a catastrophic sinking from the 1950s & now in the midst of many artificial reef sets that we've labored to build. After three spots, my clients had caught 2 small sea bass & an undersized flounder. Kane's had done no better. I ran offshore. 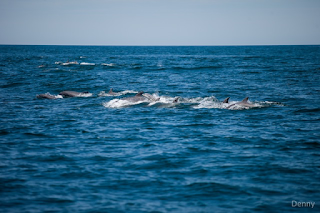 Fish Bound set off inshore.. We were running from noise. Meanwhile, another boat who is participating in a study with NOAA's Chesapeake office arrived and targeted sea bass. They were looking for 8 to 11 inch fish to tag. Not hot fishing to begin with, at some point this captain overheard the crew on the ship (by VHF radio I assume) to "turn it on" .. and for the next two hours his scientific team had not one bite -- none. The Fish Bound ran inshore - way inshore. And then had to run further inshore still where they were at last able to catch sheepshead. Hard to get the times exact. Fairly certain this equipment was on when I arrived at my next stop 7 miles further out. I had previously been able to avoid the affect of the Sheila Bordelan's equipment by running there. This time it was not enough. 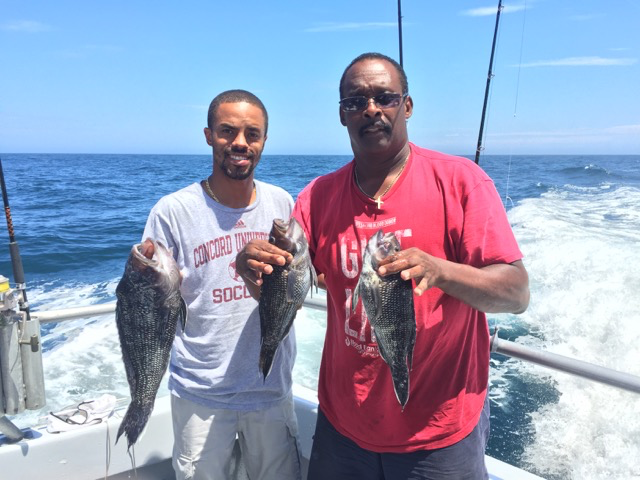 With a good sized school of sea bass beneath my boat; fish living on reef we'd hand-built with cement blocks & 7 miles from the ship -- no bites at all. Thirty seven years I've been doing this. It's not normal. I observed the bite diminish at 7 miles on radar during all the Wind Energy Area surveys. Fish would be biting fine, then slow - and then stop completely when a sub-bottom profiler was within 2 miles or so. Sea bass can be dern fussy -- but to completely shut off while hovering over a reef takes government assistance. Sure been plenty of that. Our troubles with sound & surveying began in 2013. Government's just changing WHERE the trouble is. All this sound has contributed mightily to our troubles off here. The ONLY thing management looks for is overfishing. And, by George, they can find it too. Every year there's another set of statistics no one believes that cause regulatory mayhem. For the last 5 years there's been real, serious trouble on our sea bass's summer spawning beds. The Sheila Bordelan told me they were running a sub-bottom profiler. I have no idea if they continue to. I have no idea what they are doing - none. People high up in NOAA have been unable to find out what they are doing. I don't know if the Navy is generating this noise at other locations -- seems likely. Guarantee this -- they're throwing our reef fishery in the dumpster. Inshore sea bassing is all but dead. Not just the Queen, but up & down that whole area. It's THIS time of year when these reefs should be colonized by spawners. Offshore is holding it's own - is OK. The MD Wind Energy Area (WEA) has even been recolonized. Soon flounder will be on our reefs. If they don't turn off the derned noise -- whatever it is -- those fish will go somewhere else. We've been teaching them about noise for 5 years strait. Fish seem to learn a lot faster than government. I can imagine they're right gun-shy with it. Sea bass will stay away same as when they completely evacuated all of the MD WEA and it's surrounding reefs. I told NOAA 2 decades ago we had coral reefs off here. Still waiting. Law says you have to protect, preserve, & enhance "essential fish habitat." I suppose it pays not to discover habitats you can't afford do anything with. Reported an oil spill, a fish kill -- no nothing until they hit shore. Trash in unimaginable amount - couldn't find it. 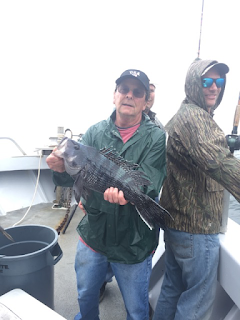 About 22 years now since I told them about habitat fidelity in sea bass -- that they'll return to the exact same reef after winter migration; that they'd ought to be mindful of it in designing regulation. We were better off with kitchen table regulation--our own regulation, a lot better off than with Council & Commission's auto-response to MRFSS/MRIP recreational catch estimates. We're going the way of the American Indian now that government's come to help. Whoever's in charge of fisheries management & restoration had best pry their eyes away from their dagoned lying computer screen; better have a look at what's real. They could start with sound. New sets of MRIP numbers will be coming out. Pure fantasy is used to regulate our fisheries. Population biology & ecology are old math; no good anymore. There really are people putting 110% into their work in management. It is very much the case that sea bass & flounder would be all but closed here. A few people working hard have prevented that. But the constant regulatory battle is draining. Fighting fantasy as if it were a threat; there's no energy left for fighting what is real, and especially for what has not been proven. For the MD WEA survey noise Bureau of Ocean Energy Management, BOEM, announced in 2015 that a sub-bottom profiler has no affect on sea bass--it's a quiet as a ship's propeller. And, if it did, it wouldn't matter because there's no reef anyway. Ain't nobody taking on the Navy. DC's a busy place. Not sure they'll have time for a new kind of noise either. Churchill: Never Give Up, Never Give In. Two log entries dealing w/noise..
..on July 31st, 2013, I was fishing the Great Eastern artificial reef about 18 NM ESE OC MD in the southern-most portion of the wind lease. I could see the Scarlett Isabella closing and watched my clients' success diminish to absolute-zero when she was approximately 3NM N our position. As my nearest reef that might provide suitable success was either 8NM south or 13NM ESE, I waited for the survey boat to turn north and move its equipment out of range (about 5 to 7 miles).